There are thousands of think-tanks in Washington focusing on many topics. 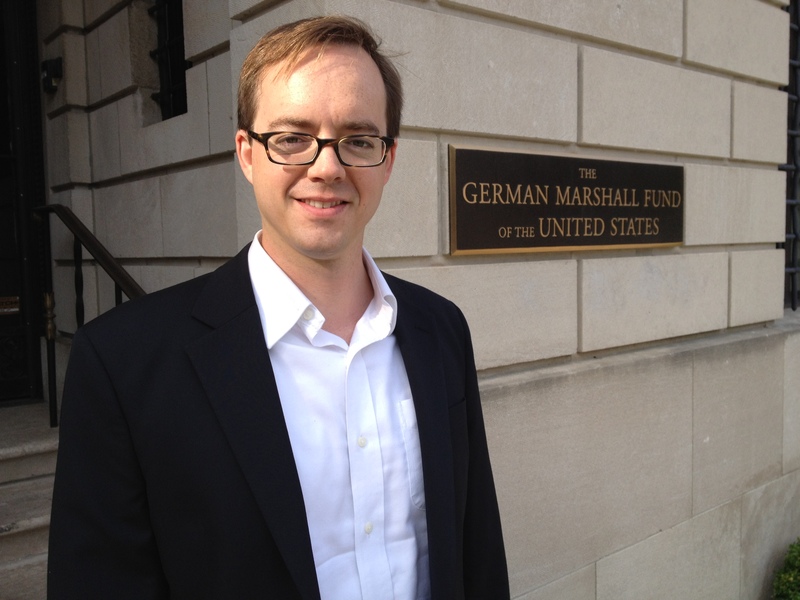 From a European perspective, the German Marshall Fund of the United States (GMFUS), in alliance with the Transatlantic Academy (TA), is one among them to be considered. In mid-July, one of its Senior Program Officers, Nicholas Siegel (St. Louis, Missouri, 1981), wrote an article about the current situation in Spain between Catalonia and the central Government in Madrid. The title (As Spain Protests Austerity, Catalonia Pushes for Independence) was so explicit that in a matter of minutes the article went viral. More than 35.000 people received it via e-mail, so far 7.000 visited to the website, almost 1.000 shared it on Facebook, and more than 400 tweeted it. «It is the biggest website sensation we have ever had,» says Nicholas Siegel as he receives me in his office in Washington. Why did you decide to write about Catalonia? What interested me about this situation right now in Catalonia in many ways is how little attention is getting outside Spain. If you would search for its latest news about the Catalan independent movement, I hardly find news in foreign languages which makes me think that there is this very important development which is taking place and no one is paying close attention to it. And that is very interesting because the last pool said that 51 percent of Catalans in a referendum would choose to leave Spain—that is a big deal! Yes, the Scottish case is getting a lot of coverage here in the United States. Interestingly, the latest Scottish pools came out in January and says that between 32 and 38 percent of Scottish would say yes to leave the UK—there is not the same level of seriousness as the potential Catalan situation! Why there is this news-blackout about the Catalan independence process? First of all, it is because there is not a lot of awareness about Catalonia. Beyond tourism, soccer—because of Barcelona team—, and food, there is nothing else. Definitely there is a lot of interest and awareness in Spain but not far behind that. So you are trying to break this blackout? The prospect of Catalan independence raises incredibly important questions. Is adding another flag at the European table going to strengthen Europe? Is that basically emblematic of a more open attitude toward the various of cultures and nations of Europe? Is this kind of a greater perfection of the European Project which has a complete respect of its diversity? Or is it a kind of step backwards into the kind of identity politics that have plagued Europe always? What Catalonia could or should do to raise awareness of its situation? What the Catalan President, Artur Mas, is doing is pretty effective: he is sort of travelling around the world being a salesman for Catalonia. Also the Catalan culture is a good way to raise awareness. There were castellers recently in Manhattan, and every time I go to Catalonia there is a festival, whether is the one with cava—Festa del Cava (Prades), for example—, correfocs—which, by the way, you could never have it in the U.S. because it is so dangerous—, castellers, sardanes… so, there is all this great traditions. And definitely it would help a media campaign to tell the world who they are and about their culture. In your article, you said that the relation between Castillia and Catalonia has a “complicated history”. How would you qualify the current situation? It is easy to see that it may be frustration in Catalonia, especially for the GDP transfer over 8 percent with Madrid. I can also sympathize with being frustrated because the Spanish Supreme Court is infringing on the Catalans abilities to choose what language are they using to teach in their schools. So I think is fair to say that part of the reason why you have this rise in support for independence is some kind of knucklehead of policies on behalf of Madrid. They are not being careful enough and sensitive enough to this issues which means a lot for people in Catalonia. What do you think would be the European reaction to a Catalan breakup? They would have to accept it. The point is what Spain would do? And I can see a potential crisis in Europe because Spain is so important, one of the top five big European countries. The Spanish Constitution delegates the unity of the country in the military. Can you see Spain using the military against a Catalan breakup process? It is almost impossible to imagine. The Constitution says that, but Spain is a modern country, integrated in the NATO and in the EU. It is part of the central Western alliance, and I cannot imagine the Spanish people, with the legacy of the Spanish Civil War in their minds, being willing to support another such war. However, I’m not saying that it is completely impossible. War would be a disaster for everyone. Would Catalonia be part of the EU the next day of an independence declaration? It is unprecedented; it has not happened before. But I know that in the Scottish case the assumption is that if Scotland became independent, it would most likely automatically became a member of the EU, even though some people say that Spain would try to stop it. So, in the Catalan case, my understanding is that it would be, if not immediately de jure, would be first de facto and eventually be made legally part of the EU. Do you think that there are people in Brussels and in Washington paying attention to this Catalan process? I’m sure that in Brussels there are, but certainly in Washington there need to be more people who are, at least, aware or keeping an eye on it so it doesn’t take them by surprise if something like this happened, because we need to be ready if it does. De ben segur que estas acertada, Diana, pero han de saber que ia un sentimnt, mes petit ó gran de la gent a Catalunya, que n´está cansada de seguir així. Volem per exemple, qu´el Presopostat pels Governs de Madrid, cada any, nomes sen ejecuti un petit %. Aquesta es una, peró nia moltes mes. Un Tarragoni.